One of the most well known places in Himachal Pradesh is Beas Kund, named after the hot water spring in the location inspired from Sage Vyas (or Beas). Located in this area is the Friendship Peak- a part of Pir Pinjal range, flaunting an altitude of 5289 m. Trekking to this peak is graded as non-technical and rather easy, though slightly physically enduring as is expected from such a trek. The first part of the Friendship Peak trekking expedition in Himachal covers Manali. Touring this hill station is an experience in self, especially during the Indian Summers. This gesture also helps body acclimatization to an extent before actually going on the trekking mode. From here one moves to Solang village to mark the beginning of the trekking, which is to Bakarthach. 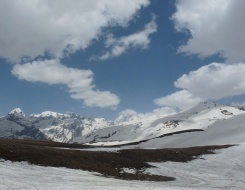 At around 3500 ft, trekker gets more acclimatization by resting two days here. 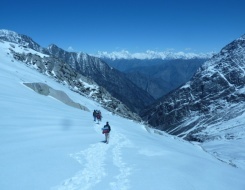 After getting boost up with rest in the changed atmosphere, trekker is ready for the final leg to reach to the base camp, followed by the Advanced Base Camp. The way back to Manali is from the same route. Manali, its tourist attractions, its people, its market and its feel is spell-casting. The magic continues in the Solang Village, place from where Solang Valley could be reached, which is at some distance from the village. Bakarthach is the next camping site amidst the greens of the hills. 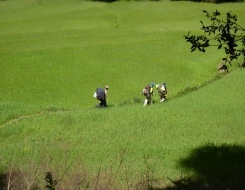 The uphill trek continues to the Friendship Peak base camp. If ready to grasp the opportunity with both hands, itinerary can give you some more insights on this adventure trek tour in Himalaya. Morning Back to Bakarthach, dinner and overnight stay. Arrival at Delhi by morning. On arrival transfers to hotel for relax. In the evening transfer to International airport to catch your onwards flight.